The system is made up of two machines – FlexWash and FlexDry – which are each equipped with a front-load compartment for normal or bulky loads as well as a top-load compartment for running smaller loads, such as delicates, at the same time. To celebrate the launch of FlexSystem in Canada, Samsung has enlisted the support of the Toronto-based lifestyle expert, Shoana Jensen, to advise consumers on the latest tips and tricks in laundry care. Among Jensen's key takeaways for laundry care include dividing loads of laundry according to fabric type and colour, as well as carefully reading clothing tags, which often advise on how to care for a particular item. More Canadians (74%) are willing to take extra steps to do their laundry by the correct fabric care instructions, with only one quarter (26%) less likely to go the extra mile when caring for their clothes. However, six out of 10 Canadians are willing to cut corners when it comes to separating clothing in the correct colour/cycle pile. With SuperSpeed technology featured in FlexWash, the user can take more time to divide their clothing beforehand as washing time is reduced by up to 50%, without sacrificing cleaning. Almost two-thirds of Canadians (63%) surveyed take three-and-a-half hours or less to complete two loads of laundry (from sorting, washing and drying). Based on insight they received from the survey, SEC believes FlexSystem is an intuitive solution for consumers looking to practice an efficient and effective way to sort on the fly and tackle the laundry process. The ability to operate all four compartments separately and simultaneously addresses strong consumer demand for an approach that values laundry care with greater flexibility. The system’s Wi-Fi connectivity allows the user to monitor cycle times, receive alerts when the cycle is complete and schedule cycles with their smartphone and Samsung’s Smart Home app. 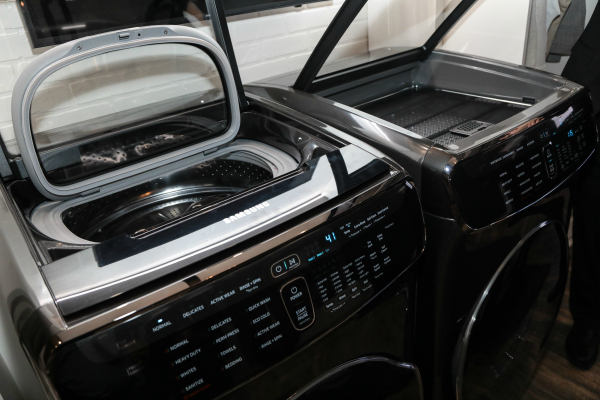 The FlexWash’s lower compartment has a 5.8 cubic foot capacity while the top-load compartment provides another 1.1 cubic feet, which is ideal for separate loads such as light clothing or athletic wear. The FlexDry can easily handle large loads and a few delicate items at the same time. The bottom compartment features 7.5 cubic feet, enough to handle larger laundry loads. The FlexSystem washer and dryer laundry pair is now available for shipping and carries a suggested retail price of $4,699.